Love how I point out the obvious. Overgrown path (same one as twist) with the pocket knife that has a 25% chance of landing a tetanus hit! *yawn* studying is boring. Lets see what's on Psypoke at the library. Oh it's starting. The card is familiar. Was going to get the bow because I can actually use one well in real life. The rope, unless used as a weapon has no real purpose (I think). The leather belt.... Hmmm. Canteen.... This should go with the bread. At least a group has food and water with it. The ball. Either pokéball or something else. The hat? Obviously a Yankees hat. But what are the Yankees doing in this world? Maybe code? I choose the card. I think I know what its used for. Now, the location. Three different paths. We don't know the weather, but for me it seems humid. Weeds, swamp, windflowers, thorns. No variety. The paths must be close together. I think we may be rejoining later. The windflowers. In my experience, games and movies will have some kind of monster. My guess, it lies here. Wouldn't be surprised if a giant Venus Fly Trap lives here. The swamp. This seems the most promising. Maybe a few crocs or alligators. Moss. Here is where it looks promising. Moss. Moss ALWAYS (if my knowledge of SpongeBob and scouts is correct) grows facing north. A sense of direction helps. It shows where we came from where we are from the place we were. We will be able to make a map. That is why, although my item will be used for a different purpose most likely, I choose the swamp path so my card (made out of paper) can be a map. Problem, we need something to write with. Dang it. THE ARROWS MIGHT BE THE ONLY THING WE CAN WRITE WITH!!! SANGUINARY. Gosh darn it. Swamp: GhostPony with Rope. Me with Card and plan. Thorns of Death: Twistedturtwig with Hat. Haunted Water with pocket knife. EDIT: HAUNTED. WHY..... EVERYONE IS CHOOSING THE THINGS PEOPLE COULD WRITE WITH AND THEN GOING ON A DIFFERENT PATH. Out of the last available items and the rope. The rope could be made as a quill. So could the metal part the threads through the holes in the belt. ^For the record, I dun't wanna be alone while I do dis. Agreed. I'm glad I'm not the only one going down the third path. And, if my hunch is correct, all of those three "strange" items are very special. Someone might want to take the first one, what I'm assuming to be a Pokeball, which could be very useful as well if a group runs into a monster of some sort. I'll take the canteen of water. As for the path, I'll go down the...Overgrown path. Besides James, there are only three paths and nine of us, you twit. Sanguinary: Yep. That's what I thought it was. Wasn't 100% sure though... Glad someone agrees with me. Haunted Water: Why exactly are you calling me a twit? I chose the rope and the swamp, because if someone get stuck in mud, I'll use the rope. Sorry, forgot to add my reason above. Damn, we're a Pokemon forum, right? If there are no Pokemon in this story, then Argo is a n00b. I pick the strange ball and I'll follow the third path. It's hard to walk, but this means huge imaginary beasts can't walk in it as well. Chill, just a theory, but if you're taking the Pokeball, the first path sounds the best. Tall grass and weeds... possibly a connection? I mean, that is where you find Pokemon, after all. Meaning, there are three paths and nine players, so 9 players divided by 3 paths means that there will be repeats. I'm taking the extra leather belt and I'm going down the overgrown path. Canteen: might get the chance to fill it up at a river. Maybe offer some to a NPC in return for something? Bread: same thing about the NPC. 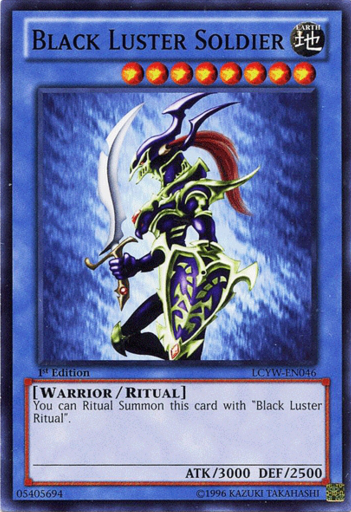 Card: Black Luster Soldier (/envoy of the beginning). Maybe trade it to a collector? Cap: Maybe we'll run into some Yankees fans from the future who will help us? Looks like I'm stuck with the bread... or am I? I take Argo's bag (and jacket if he had one) and the bread. Thinking outside the box ftw! oh, and I take path 3. Sanguinary, it looks like you'll be on your own. You've got the bow and arrows though, so you can use them to fight off an enemy, or hunt for food, both of which are very good uses. You might even be able to find some more arrows along the way, or make them yourself. GP could use the rope as a snare to catch food, or to save one of the two of you from falling. James, since the card is probably that Yugioh card, I wouldn't write on it, and instead save it for if you're attacked by someone or something so that you can summon the soldier guy to help. Last edited by twistedturtwig on Mon Apr 22, 2013 2:33 pm, edited 1 time in total. @ everyone: Wow. I never knew I'd get such fast responses. I'll post the next part as soon as I get the chance! Next few days, maybe tonight or tomorrow. @ Drago: I was waiting for someone to try this. Congratulations, you figured out that this game is slightly more realistic than it seems. You get the bag, the bread, and the jacket, which yes, Argo was wearing. Course, it has a hole in it from being shot and killed and all... But you still got in. @ TT: Thanks for the list. Now I don't have to do one myself. GP, looks like we're alone... In a swamp. Make a swamp monster to protect us? Y U NO COME WITH US TO THE SWAMP?!?!?! Y U ALL GO TO THORN MAZE?!?!?! Sanguinary, good luck. You will need it against the Piranha Flower. James, I have confirmation from Argo that for the first couple of rounds at least, you won't be able to die. It would be kind of stupid if someone died on the very first round. So about 2 or 3 rounds in, that's when the chance to die will start. GP, looks like we're alone... In a swamp. Have you played mystery dungeon games, mostly Blue Rescue Team? Well, they are traveling and surviving, and they are two! So yes, we can do this. Totally agree, swamps are awesome! 1. Scream at the others for not coming to the luxurious mud pond resort. 2. Almost die because you're a massive klutz and fell into the swamp. 3. Have GP waste his rope saving you. 4. Almost die again because of alligators. 5. Waste your Yu-Gi-Oh trading card. 6. Cross paths with the thorn maze group. 7. Make sure your lister guy is alive. 8. Slaughter the group until your Luster knight is hungry with power. 9. Provoke the Luster Knight. 10. Die a horrible painful death. Slaughter? lol you forgot about my Tetanus-inducing pocketknife. And here's a hint: I'm good with blades.